This salad is a nutrition power-house. 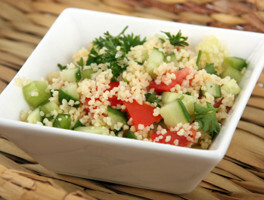 Quinoa is a gluten-free grain that provides carbohydrates and protein and the low-carb veggies add fiber and potassium. Cook quinoa according to package directions with chicken broth. Let cool completely. In a large salad bowl, combine cooled quinoa and remaining salad ingredients. In a small bowl, whisk together dressing ingredients. Pour over salad and mix to coat. Serve cold.